The industrial building and offices has a steel frame, bolted in the factory area, and bolted and welded in the office area. The curtain wall of windows in the office area is accented by exposed exterior columns. This architectural detail (the columns) was originally developed by the architects for a school building, to aid in the addition of a second storey. The building has concrete floors throughout and a steel roof deck. Negatives for these prints are found in file 2009.002.2016. 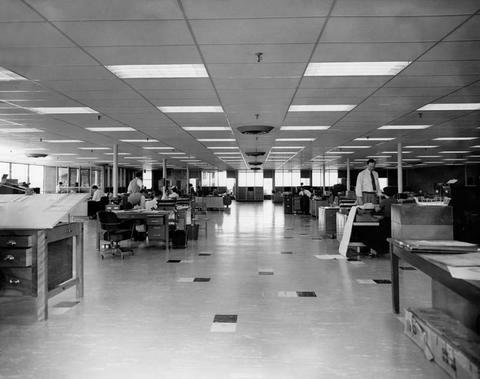 "Office & Plant, Burndy Canada Ltd." The Canadian Architect October 1957: 27-32.